It’s a bit of irony that as a child I never liked writing. I have very vivid memories of myself throwing a tantrum on the floor, pleading to my mother to help me write my three (yes, three) sentence synopsis of a news article. I’d do everything in my power to avoid constructing a complete sentence—incorporating verbs, a subject, and expressing a complete thought was akin to a form of torture for me. I even succumbed to plagiarism. I’d pay a friend of mine with Capri suns and homemade brownies in exchange for having them write a news article about the upcoming security changes at Oppenlander Park or the new dog leash laws near Marylhurst University. Some kids liked school, they reasoned their time would be well spent learning, instead of screwing around and doing whatever they wanted. It was nothing I wanted for myself, but I suppose it’s fine to those who prefer knowledge and learning to things of real value. But perhaps I just went to the wrong school. If I had, for example, gone to a place like Schoolhaus Brewhaus instead of Stafford Elementary I might have actually applied myself. 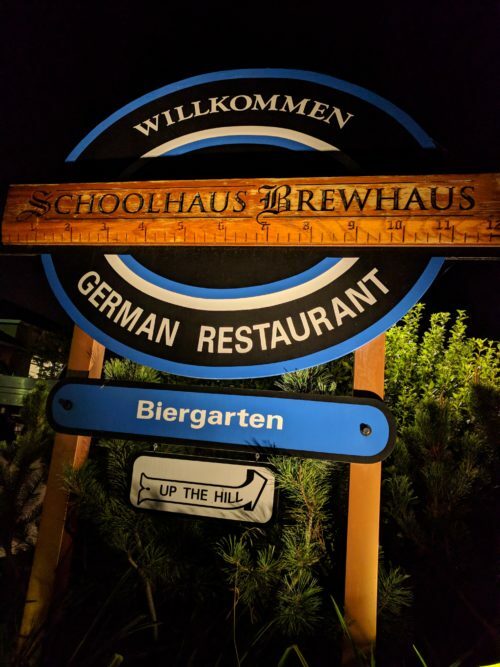 Schoolhaus is a restaurant located in Jacksonville and is a place I’ve been near many times. I’ve frequented their auditorium for various Craft Beer expos or played kickball in the grassy field on their property but, before this week, I’d never been inside. They specialize mostly in German style food with combination of German and American cocktails for their bar menu. They’ve got a form of happy hour (daily specials) and their cocktail menu features over half-dozen craft cocktails. I had their Berlin Mule, a slight twist on a standard Moscow Mule that added a tinge of bitters. For dessert I tried their Die Eier Frau. A cocktail that combined some unlikely ingredients (Jägermeister, Hot Monkey Vodka, with some coconut rum) to create a creamy and delicious concoction. They’ve got some great outdoor seating, an aforementioned grassy field to hang, as well as a historic building. Oh, yeah, did I mention the building used to be an elementary school? They retrofitted a 100-year-old school to become a bar and restaurant. Frankly, it feels very American that we’d change something like a place for higher learning to a place of imbibing. Regardless, they use the site well. They run an Oktoberfest every year, as well as plenty of other beer related events. They have a mug club for those fanatic regulars. Their menu is affordable and the location feels local centric while allowing an outsider like myself to feel welcome. Jacksonville isn’t that far out, but I’ve always felt like it’s a bit of a destination; like if I’m going out there, I need to hit a few spots. Schoolhaus is going to be one of those go-to places moving forward, especially for their cocktails and outdoor seating. I feel as though I’ve come full circle, from that 3rd grade version of myself who’d spend his Sunday nights on the hardwood floor, wracking his brain to eke out sentences for his news article review. How would he feel, if I told him that someday he’d be sitting at home writing a several paragraph synopsis of a local business?